So, I saw this picture on Facebook a few days ago. 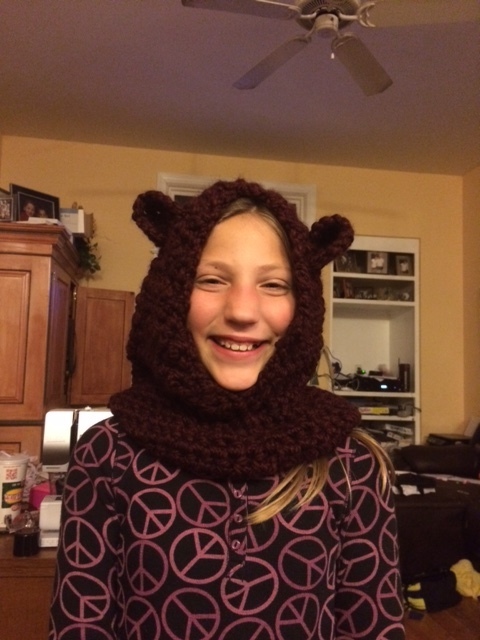 It was a picture of a cowl / hood that is crocheted and has bear ears. 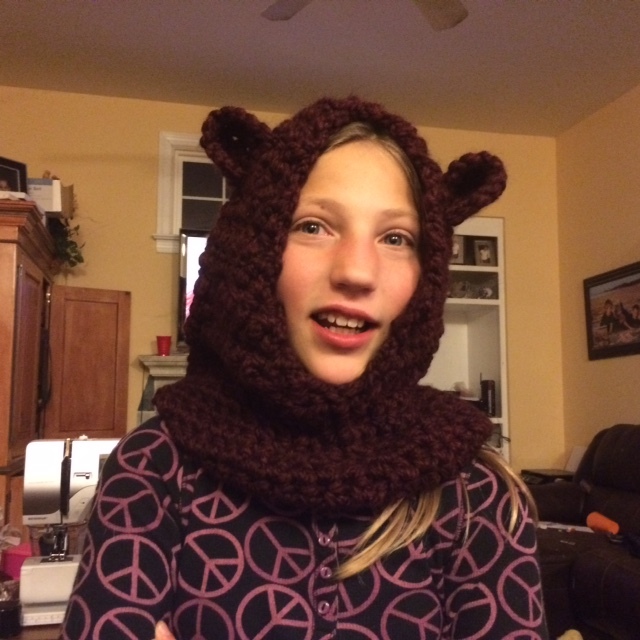 It was finished with a button on the cowl area and could be worn up or down. Now, I dabble in knitting and have taught myself how to crochet in the past but have never successfully completed a project in it. But I decided to try and make these for the girls for Christmas. I ordered the pattern and ordered the suggested yarn from Walmart.com in a dark purple/burgundy and light pink colors. The supplies arrived yesterday but the Crochet book I ordered at the same time didn’t arrive until today. Luckily there is the internet and I was able to get started without the book! So I headed back to the car to try and keep the girls warm for an hour until our game would start. I started to head back down the street to try and find some coffee but pulled into the adjacent parking lot and lucked out that someone was leaving so was able to move closer so we would be able to see the other teammates. So, while in the car, I decided to pull out the yarn and hook and see if I could get started. The crocheting went incredibly fast; the project is essentially one type of stitch with very little variation and the yarn has a gauge of 2 stitches = 1 inch! Amazingly, I finished the entire skein of yarn. Not only that, but I realized about half-time, that I had done 3 rows incorrectly and this yarn is so forgiving, I was able pull it out without losing a stitch. After 2 overtimes and a heartbreaking loss for our team, we arrived home around 3:30. 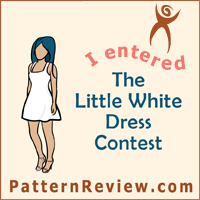 So I sat down and finished it. The girls kept asking me what it was and who it was for – so finally, I had Amalia try it on (after telling a little white lie about who it is for). I still need to put the button on, but I am so happy with it. Amalia loved it and kept asking if I could make one for her too. (so I accommodated her request and started working on hers this evening!